CinePost boasts a full featured audio suite that is optimized for your voice over recording needs. We have professional equipment in house including microphones, mixers, and a digital audio workstation. Our suite has a custom built isolation booth to eliminate the possibility of any extraneous noise being recorded and talented engineers to assist during your session. Our previous clients have included voice-over recording talent for commercials, overdubs for television shows, and audio-book style long form reading. At CinePost’s convenient metro Atlanta location in Marietta, GA you’ll deal with a professional audio engineer. 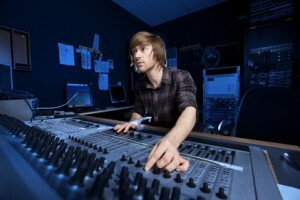 Your engineer will give dedicated attention for the duration of your recording session. In addition to getting high quality audio we offer post processing to sweeten the sound to industry standard broadcast quality. This includes proper equalization and compression to make your vocal talent sound its best. We can edit together comp takes, remove any mistakes or vocal issues such as coughing so that when you leave you have a finished product. Our facility is open during normal business hours, 10 AM – 6 PM Monday through Friday. Weekend sessions are available upon request with a deposit. Sessions are set up prior to the talent’s arrival, so when you get to CinePost all you have to do is come back into our audio suite and focus on delivering a good performance. We have been involved in the broadcast industry for almost two decades and our engineers have years of experience dealing with voice-over recording. If you want someone who will treat your project with respect & professionalism then CinePost is here to serve your needs.